Cocklebiddy is situated 66 kilometres east of Caiguna and and 91 kilometres west of Madura. Cocklebiddy lies on the southern edge of Western Australia's truly vast sheep grazing belt. Within the area are several large scale sheep grazing operations, some larger than a number of European countries. One such station is Arubiddy which spans an area over 3200 square kilometres. With limited rainfall sparse stocking rates of about 8 to 10 sheep per square kilometre are the norm. During its pioneering years Cocklebiddy was the site of an aboriginal mission. Today however, all that remains of the aboriginal mission are its stone foundations. In recent years Cocklebiddy has gained an international reputation as a site for one of the world's largest cave systems. Ten kilometres to the north west of Cocklebiddy Roadhouse lies Cocklebiddy cave. In 1983 a French caving expedition created caving history by exploring Cocklebiddy Cave to an unprecedented distance of 6.4 kilometres. This record was later broken in 1995 by an Australian named Christopher Brown - bettering the 1983 record by a mere 20 metres. Cocklebiddy cave system is unique in that the cave system extensively penetrates an aquifer that lies 90 metres below the Nullarbor Plain. Within Cocklebiddy cave are a number of vast limestone caverns, rockfalls and saline subterranean lakes that extend for several hundred metres. During World War 2 Australian Army engineers attempted to tap water supplies from Cocklebiddy's vast underground lakes. All their attempts proved in vain however. Reports from the time indicate that Army Engineers were disappointed to discover that a thin skin of fresh water overlay a much greater volume of highly saline lake waters. Caving in the Cocklebiddy area is really only recommended for highly organised and experienced caving groups. 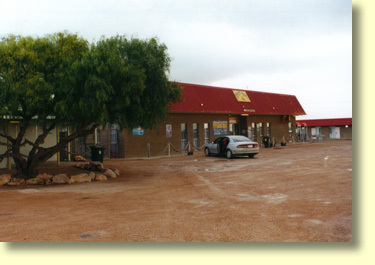 For the Nullarbor traveller Cocklebiddy Roadhouse is a useful road stop. Cocklebiddy's Roadhouse provides the traveller with the usual array of takeaway foods, a licensed restaurant, and a bar with pool table. Please note Cocklebiddy Roadhouse does not have wifi or computer access. EFTPOS facilities are also available and the area has telstra Mobile phone coverage only. Opening hours for the Roadhouse are from 6-00AM to 9-00 PM seven days a week. Regular Bar opening hours are 10 AM to 9 PM. Sunday Bar hours are also 10 AM to 9 PM. At Cocklebiddy's Wedgetail Inn the traveller is provided with 24 Motel accommodation units and a caravan Park. For further information telephone (08) 9039 3462 or Fax (08) 9039 3403. Many travellers see Cocklebiddy as little more than a welcome rest stop on the Nullarbor. For those of you who are prepared to depart the Eyre Highway however, the Cocklebiddy area does have attractions of note. One such attraction is Twilight Cove which is located to the south of Cocklebiddy. Here the Nullarbor's limestone cliffs tower 70 metres or more above the Great Australian Bight. Apparently good fishing opportunities can be found along this remote area of coastline. Twilight Cove is located in Nuytsland Nature Reserve and access to the area is only possible via 4 wheel drive vehicles. Ask for directions from Cocklebiddy Roadhouse staff. Ten kilometres to the northwest of Cocklebiddy Roadhouse lies Cocklebiddy cave. Here travellers can view the entrance to one of the worlds largest cave systems - just watch out for the occasional snake! Exploration of this cave is really and truly only recommended for highly organised and experienced cave groups however. Nullarbor caves can be quite treacherous and as the sign says at Cocklebiddy Roadhouse, "Caves are High Risk Areas." Perhaps the best attraction in the Cocklebiddy area is Eyre Bird Observatory. Depending on how the crow flies, Eyre Bird Observatory is located 40 to 50 kilometres to the southeast of Cocklebiddy. Access to the area is via a turnoff on the Eyre Highway, 17 kilometres east of Cocklebiddy. Conventional vehicles can travel along the access road as far as the lookout; located 4km past the microwave tower. Please note road conditions in the area can be variable. At Eyre Bird Observatory day visitors are welcome and a modest entry fee is charged, which includes a guided tour of the facility and access to the surrounding area. Eyre Bird Observatory also provides overnight accommodation including meals. Should you not possess a 4 wheel drive vehicle a pick up and drop off service is offered by the Caretakers of Eyre Bird Observatory, for guests staying two or more nights. For serious naturalists Eyre Bird Observatory can also provide overnight accommodation in this truly unique and remote part of the world. There's more to look at than just birds! Eyre Bird Observatory is Australia's first Bird Observatory and is run on a non-profit basis. For bookings and further information on Eyre Bird Observatory please telephone (08) 9039 3450 or Fax (08) 9039 3440. Email contact can be made via eyrebirdobs@bigpond.com. To avoid disappointment advance bookings are essential. If you are travelling in the middle of the night, the nearest 24 hour roadhouses are at Border Village to the east, and Caiguna to the west. Having said that travel at night is best avoided - unless you are driving a semi-trailer rig!